This week we have been out and about in Cologne, Germany for one of Europe’s biggest interior fair IMM. Before heading to Maison & Objet this weekend, we wanted to share some of our favourite our personal Urban Jungle Bloggers’ favorites from Cologne with you. Here we go! Interesting watering cans spotted on the stand of Alias /// Four minimal shelves holding four Muehlenbeckia plants add color and texture to this seating area with velvet chairs by WOUD. Another favorite are the Blumenampel by Atelier Haußmann designed by Zascho Petkow that become true eye cathers in any interior. They are made from matt black steel tubes with a PVC vase and thick rope. 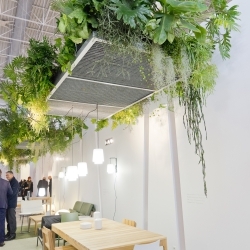 Stay tuned for more plant trends that we hope to spot at Maison & Objet in Paris this weekend!